With forced air, anyone seated near a large window, whether in an office, restaurant, home or hotel, feels the chill, even though the heat is on. No matter how high the thermostat is turned up, the window will remain cold, Kilbride says. Radiant heating can be explained by a core scientific principle: Heat transfers from a hot object to a cooler object. It’s how the sun heats the earth. As a building principle, it dates back to Greek and Roman times. That said, it has only been commonly applied to modern construction since the 1980s. Comfort was a huge priority for the developer of New York’s Hyatt House, an extended stay hotel in Manhattan’s Chelsea neighborhood that will open in the fall of 2016. Early on in the project, the engineers considered their heating options. The developers needed the floors and windows to all remain warm, but they couldn’t use a system that blocked views of the Manhattan skyline. Enter, ThermaRay. Comfort is a major benefit of radiant heating—but it’s far from the only one. ThermaRay’s system, which is powered by electricity, is extremely effective at delivering warmth and comfort while saving energy. Unlike a duct-based system, it’s not circulating air, which potentially can transfer dust and allergens throughout a building. Perhaps best of all, there are no maintenance costs. That’s because there are no moving parts, no bearings, nothing to rust or corrode. “If you design the radiant heating system right from the start, it will last as long as the building lasts,” Kilbride promises. “Radiant heating panels offset the heat loss at the window while making the guest experience pleasant, providing them a gentle warmth while sitting on the bed near the curtain wall and window,” Dinaburg says. “The problem with glass towers is that standard HVAC systems can’t provide comfortable heat at the glass, thus making it uncomfortable for those sitting next to the windows,” adds Kilbride. The radiant heating systems made by ThermaRay are powered by electricity. Hyper-effective panels installed in the floors or ceiling contain coils—much like those in a toaster—that radiate heat. This heats the solid objects in a room, such as furniture, floors, windows and even people. In doing so, it reduces the difference between your body temperature and objects such as furniture and windows. That chill you feel when you sit by a cold window? That’s the sign of a big temperature difference. Maintaining the design, look and feel of the Hyatt was very important for the architects. The heating panels themselves are invisible to hotel guests. Because of the room layout, the Hyatt required very slim heaters. ThermaRay custom-designed units just 2 inches deep that could be completely hidden by the window valance. Controls in the room allow guests to adjust the temperature. “Getting the temperature right is becoming increasingly important for developers today—both for pleasing their customers as well as for meeting sustainability standards, such as LEED.” Kevin Kilbride says. 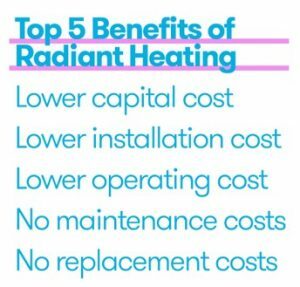 I had never thought about radiant heating as something that is similar to how a toaster works. This is an easy way of thinking and visualizing how it works. I have been thinking about putting this kind of heating in my house. I’ll have to explain it this way to my wife so that she better understands it. We are in our second home powered by thermaray radiant heat. It is truly the best system available. Low cost highly efficient. The house is R2000 rated and cost effective. Wonderful system. Been a user since 1985. Thank you for your very kind comments! It’s always a pleasure to hear feedback from our customers. I like that this article talks about how radiant floor heating is comfortable and effective while also saving energy. This would make it a great way to keep your feet warm without having to spend too much money. When choosing radiant floor heating, you’d probably want to hire a professional to install it so that it’s done correctly in order to make sure it is effective. I think it’s important to note that not all radiant systems are floor-based systems (which your comment seems to imply). There are radiant ceiling systems and wall systems as well. Depending on your circumstances, each system has its merits. A quality radiant heating project will take this in mind and employ the best solution. Also, some radiant heating installations can be a Do-It-Yourself project. I agree, though, that a professional installation can result in superior results.